Looking for a Cooperstown taxidermist? Or close to Cooperstown, NY? Then look no further. Cliffords Taxidermy is within reasonable driving distance. Although we are not located in Cooperstown, once you are on Route 28 you will only have to put your blinker on three times before you roll into our driveway. 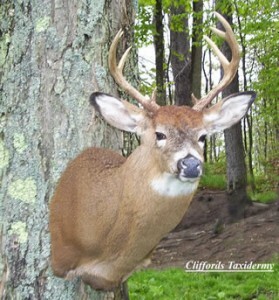 Cliffords Taxidermy services all areas surrounding Cooperstown, NY. Our customers come as far away as from Springfield Center and Richfield Springs. We are well known to the sportsmen and women of northern Otsego County.